We have a lot of shoes in our family. Six people, each at least with a few pairs of shoes... It adds up quite quickly. Before we moved to our current home I tried to declutter as much as possible, and in doing so, got rid of all the pairs of shoes that people refused to wear or no longer fit, because we had so many shoes in the old house that we needed a huge amount of space to store them all. And when space is at a premium, it is silly to allot so much of your limited space to shoes. But even after going through the shoes and getting rid of what no one wore, we still needed a place to store our shoes. We don't have an official mudroom or similar in our current place, but right next to our front door there is a narrow area that is dead space, because it is too small to put any regular furniture there, but it seemed too big to not be used. 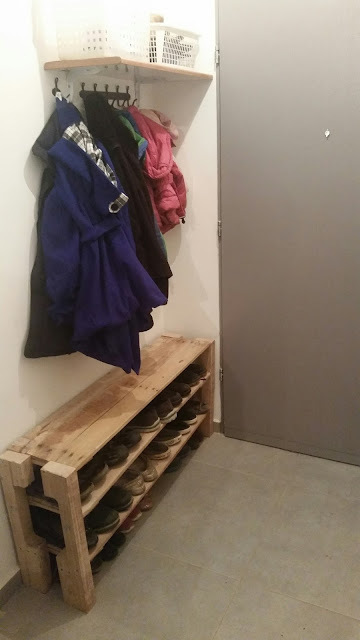 Pinterest showed me many ideas of compact and useful mudrooms and I decided to use that as inspiration to design our entrance as a good storage space for shoes, coats, gloves and hats and umbrellas and all other seasonal weather gear that we'd need right near the front door. I love how this came out so far. It is still a work in progress, but thus far it is loads better than how it was before. 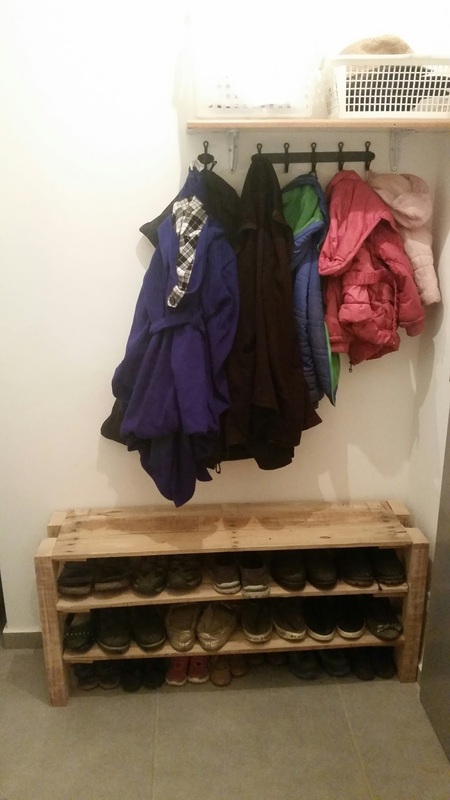 The shoe rack was made entirely from a pallet that I dumpster dove. To make it, Mike and I cut apart the pallet (mainly using a jigsaw), and then made three separate shelves from three peices of pallet wood laid next to each other and connected with a short peice of wood pallet at each end to make a shelf. The sides were the wood from the center of the pallet- good, strong and sturdy wood. We simply measured the distance we needed between each shelf and then screwed them onto the pallet wood on each side. It was a relatively easy project and took a few hours to do it while taking care of the kids as well. Above the shoe rack we hung a shelf made from an old kitchen door that we dumpster dove and two L brackets we had in our house already. On the shelf will be boxes of gloves, hats, and scarves. We may or may not add another shelf next to it to make it wider, depending on whether or not we need it. The baskets are what we currently have in the house, but I am going to be keeping an eye out for the perfect matching baskets or boxes for that. We still haven't put the hats and gloves and scarves in the baskets yet- that's the next step. I hung up hooks underneath it- the only expense for this project thus far- I bought them at Ikea, to hang coats. I think the hooks cost me a few dollars. I want to figure out a solution for umbrellas, especially where to put them when they are dripping wet and need to dry off. I was thinking some sort of metal round basket to be on the side of the shoe box, but am happy to hear other ideas. I have to decide if I want to paint the shoe rack and shelf, and if so, what color, or if I should leave them blonde. We thought to maybe make the shoe rack into a bench but it isn't strong enough for that, so it looks like it may be the perfect place to put backpacks and pocketbooks instead. Do you have a small area near the entrance to your home that you've turned into a mudroom? How did you do it? Do you have any pictures to share? If you'd paint this, what color would you choose? What do you use to store shoes in your house? Does this shoe rack look like something you'd build? We bought a large ceramic container--@10 inches x 30 inches--at Ikea and use that to hold umbrellas, canes and yardsticks. It doesn't work well for folding umbrellas but everything else works great! I don't like leaving purses or anything expensive near the front door because of potential robberies. I've heard of a few cases where the robber opened the door, grabbed whatever was within reach, and left. Looks good and useful. Kudos on attaching securely. If you have room, suggest a chair or stool for slipping shoes on and off. Happy New Year! nice. I try to keep stuff off the floor if possible so when I sweep I don't have to lift items off the floor. very nicely done!thanx for the pics! we enjoy seeing how you are arranging your home! I have a space very similar to yours. I have a storage bench where all the out of season items live. School bags and in season items go on top of the bench. We have hooks attached to short boards (to group them for a pleasant look) and that is where all the coats and scarves go. Let me just say we have way too many coats for 4 people! I like what we have, but I really would like a shelf above the hooks like you have. This is fantastic!!! I love it! We have an area for keys/purses/backpacks near what I call our mudroom/landing space. It's fantastic bc we don't loose keys anymore & don't forget things we need to take with us on our next trip out the door! I like the rustic look to your shoe storage as is, a clear gloss sealant would allow you to wipe down the shelves if mud comes in. A dark color stain & sealant would hide dirt well & look modern.